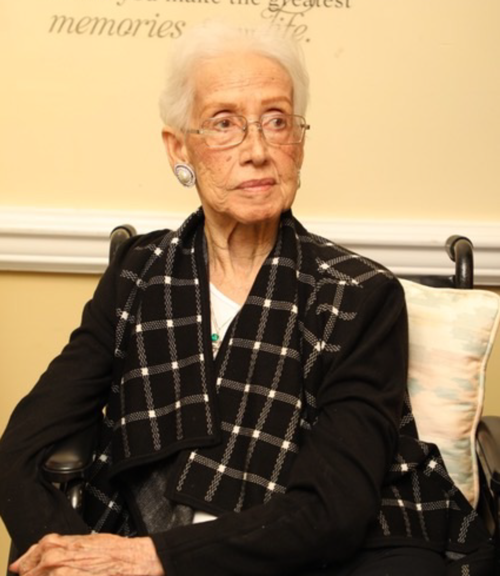 Mathematician and computer scientist Katherine Johnson was born in 1918 in White Sulphur Springs, West Virginia. Her mother was a teacher and her father was a farmer and janitor. From a young age, Johnson counted everything and could easily solve mathematical equations. She attended West Virginia State High School and graduated from high school at age fourteen. Johnson received her B.S. degree in French and mathematics in 1937 from West Virginia State University (formerly West Virginia State College). Johnson was one of the first African Americans to enroll in the mathematics program at West Virginia University. After college, Johnson began teaching in elementary and high schools in Virginia and West Virginia. In 1953, she joined Langley Research Center as a research mathematician for the National Advisory Committee for Aeronautics (NACA), where she put her mathematics skills to work. She calculated the trajectory for Alan Shepard, the first American in space. Even after NASA began using electronic computers, John Glenn requested that she personally recheck the calculations made by the new electronic computers before his flight aboard Friendship 7 – the mission on which he became the first American to orbit the Earth. She continued to work at NASA until 1986, combining her math talent with electronic computer skills. Her calculations proved critical to the success of the Apollo Moon landing program and the start of the Space Shuttle program. Johnson, who co-authored twenty-six scientific papers, has been the recipient of NASA’s Lunar Spacecraft and Operation’s Group Achievement Award and NASA’s Apollo Group Achievement Award. On November 24, 2015, she received the nation’s highest civilian award, the Presidential Medal of Freedom, from President Barack H. Obama.